I have had my lathe less than 5-days and turned 1 1/2 pieces (second piece is still on lathe to be completed) and when I tried to switch from a ‘live end’ to a ‘drill chuck’ on the tailstock, IT WAS FROZEN IN PLACE. I figured I had done something wrong and immediately did an Internet search, only to find pages of identical issues popping up. OK, what is/are the tricks of the trade for NOT having your MT#2 get stuck, either in your tail stock OR your head-stock? I made all the calls to the service center and tried their instructions, and then even tried some more direct methods. All failed. I know I destroyed the ‘live-end’ in the process, but don’t know about the lead screw assembly. User error or fluke? I just don’t know… It is happening on many brands. All I do know is that, if not covered under warranty, then it will cost me ~$85 to replace said parts. Why is this such a common problem with the #2 MT? Is there any way to prevent getting “Stuck” with this problem? Clean both taper surfaces before installing the tool. Fully retracting the tailstock ram unseats the taper. A knocker bar through the headstock spindle hole is used to unseat that end. I have the same problem with my Jet Mini. Had it out once, replaced the live center after the drilling, and now the center is stuck. I followed the “use a spacer behind the center as you retract back into the tailstock. This popped the bearing of the center off it’s stud. I just put it back into position, snugged the tailstock up to the headstock spindle and used the tailstock crank to swage the live center back into position on the stud. Hope that works for you. I’m still not able to drill but at least I can turn. Jet sells a tailstock spindle with the female part of the taper, if I ever get flush again I might buy one of those as a dedicated drill chuck unit. P.S. Tried all the spray lube. put the taper/spindle in the freezer, then heat the sleeve, tapping with a hammer to free the parts…blah, blah, blah. 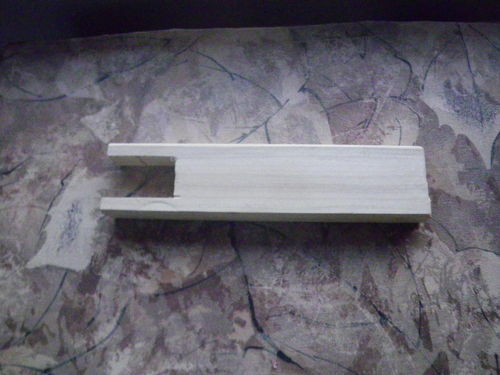 I made this simple device, it’s a piece of wood! Just slip it between the live center and the tail stock and retract the tailststock until the Morse taper pops free. Unfortunate for me, the taper fails to pop free. Bondo, the bearing head of the live-end popped off, leaving just the #2MT in the receiver. Just how tight/loose do you set the tailstock with a live-end? Do you crank it nice and tight? Do you just barely get the point of the live-end into the block being turned? Do you pre-drill a hole for the tailstock live-end point before you start? How do you set your headstock with the various options? Ok, well you have a different lathe than I do. I have not had that problem. Can you remove the quill from your tailstock? Just crank it all of the way forward until you reach the end of the threads and pull it out. There should be a hole all of the way through the quill and you can insert a steel rod and knock it out from the back. That is the way mine works, I have an ancient Rockwell. Your owners manual should help you here. I have a Harbor Freight 10×18 lathe, as well as a metal lathe. On both, when the tailstock ram is fully retracted, the screw that drives the ram hits the end of the tool and unseats the taper. Tried the steel rod and hammer as well but it didn’t budge. Have any ideas on preventing this from happening in the future? Take the tailstock quill apart. There is should be a through hole that goes into the back of the taper. There also might be a slot for a drift wedge to pop it out. It is rarely a blind taper. You might have to unscrew a threaded stud for the adjuster. If there is no hole, make one. What are you going to do? Break it? It’s already borked. Pop it out with a punch. You might have to get “a bigger hammer.” It will take whacking with quick shocks, not a pounding. Just to set it vibrating. If that doesn’t work, get someone with a mill to slot the sides for a wedge to drive it out. Again? What harm can you do? It’s useless like it is. A torch can come in handy to make it bigger. You don’t want to have the center really tight. It will bow the workpiece. Pre-drill with a center drill. Deep enough to suit the point of the center. Most times I just tighten it up enough that the center just starts turning with the stock. Snug, not tight. When you set a taper, just give it a slap in. It will tighten up if it tries to spin. Sorry Mike, I have not had that happen to me. Mine pops pretty freely. I usually crank the tailstock until the dogs in the drive center grab the the wood enough so I can turn it w/o it tearing free. Depends on the wood species primarily how tight that needs to be. Or in the case of using a chuck, the live center doesn’t need to be super tight, but enough to keep the wood from moving laterally. I do try to keep the Morse tapers clean. ”...You don’t want to have the center really tight. It will bow the workpiece. Now THIS makes sense, at least for the future. Just wish I knew this from the get go. I am pretty sure I had torqued the live end pretty tight. Had never done it before, so probably my error. Good advise above, for moving forward. Worst case for the future would be that if this happens again, just buy another lead screw assembly for $50, and leave the frozen live end or drill chuck in-place on that one and have a spare. And David, FWIW, the head of the live end is long gone and all you can see if vise-grip marks and even inside the hole where you can get to the other end of the live end, that is now beat up as well. I tried using a 1/4in ratchet extension bar to beat with. Completely frozen. And I can’t get mine to stop turning loose (on the head side). Clean clean clean, seems to work the best. Did you clean the cosmoline off everything with mineral spirits or the like? Were you using any kind of spray finish near the lathe? Did you get any sawdust or chips in the taper? As for prevention, get one of these and use it in both tapers before and after every turning session. When you’re putting a piece on the lathe between centers, bring the tailstock up with the live center backed all the way in. Drill a hole in the end or use an awl or counterpunch to make a small hole in your workpiece. Bring the tailstock up until the live center is seated in that pilot hole, snug but not tight. Turn the wheel to tighten the live center perhaps a quarter turn. Now turn the lathe on. Listen to the sound it makes. Tighten up the live center until you hear that sound change. It’ll turn into kind of a whining, binding kind of sound. Back the live center off just until it stops making that sound. At that point, you’re ready to rock. Rich, I thought I had cleaned everything well. I am now thinking I probably set the live end too tight. Never having done this before, I don’t really know. That MT cleaner looks like it’ll do the job!